BIRMINGHAM, Ala. – Nodules — a type of abnormality detected by ultrasound — are extremely common in the thyroid gland. Up to two-thirds of adults have nodules in this gland, and most are benign or only cause a slow-growing cancer that is no threat to life. A minority are aggressive cancer that requires treatment, leaving physicians and patients with a problem — which nodules need to be biopsied for malignancy tests, which nodules show a small risk and merit observation without a biopsy, and which need no follow-up at all? Thyroid cancers are greatly over-diagnosed in the United States. 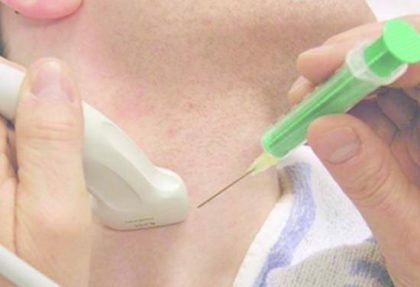 About three-quarters of thyroid cancers in women and nearly one-half in men would not — if the nodules had been left alone and not biopsied with a needle — resulted in symptoms or death. “This potentially will have a big public health effect,” said Tessler, who is also the Radiology executive vice chair and medical director, vice chair for Radiology Informatics, and division director of Diagnostic Radiology. The 15 co-authors on the blue-ribbon committee with Tessler are at Washington University School of Medicine; Keck School of Medicine, University of Southern California; Duke University School of Medicine; the University of Alabama at Birmingham; Brown University; Stanford University Medical Center; Brigham and Women’s Hospital; Hammers Healthcare Imaging, New Haven, Connecticut; Yale School of Medicine; Johns Hopkins University, School of Medicine; the University of Pennsylvania; Mayo Clinic College of Medicine; and the University of Texas Health Sciences Center. Their Thyroid Imaging, Reporting and Data System, or TI-RADS, is modeled after the American College of Radiology’s BI-RADS, a widely accepted risk stratification system for breast lesions. The experts sought guidelines that are 1) founded on ultrasound features defined in their previously published lexicon; 2) easy to apply across a wide gamut of ultrasound practices; 3) able to classify all thyroid nodules; and 4) evidence-based, to the greatest extent possible, with the aid of underlying data on 3,800 nodules and more than 100,000 cancers. Their new guidelines follow many attempts over the past 15 years to create guidelines for whether to do a fine-needle aspiration biopsy. Most are based on details of the appearance and size of nodules that are visualized with high-resolution ultrasound. But “the plethora, complexity and lack of congruence of these systems has limited their adoption by the ultrasound community and inspired our effort to publish a classification system under the auspices of the American College of Radiology,” Tessler and colleagues write. The American College of Radiology TI-RADS has five different categories for nodule appearance — composition, echogenicity, shape, margin and echogenic foci. The shape category has two choices — wider-than-tall vs. taller-than-wide. The other four categories have four choices each, such as “hypoechoic” under the category echogenicity or “lobulated or irregular” under margin. Each choice as a point value, ranging from 0 to 3 points. “Wider-than-tall,” for example, is 0 points, and “taller-than-wide” is 3 points. If the sum is 0 points, the nodule is TR1 and the guidelines recommend no fine-needle aspiration or follow-up. If the sum is 2 points, the nodule is TR2, or “not suspicious,” and the guidelines recommend no fine-needle aspiration or follow-up. A sum of 3 points is TR3, or “mildly suspicious.” For these nodules, the guidelines recommend fine-needle aspiration if the nodule is 2.5 centimeters or greater, or about 1 inch or more, and they recommend follow-ups with subsequent ultrasounds if it is 1.5 centimeters or greater. TR4 nodules, or “moderately suspicious,” are 4 to 6 points, and TR5 nodules, or “highly suspicious,” are 7 points or more. For TR4 nodules, the guidelines recommend fine-needle aspiration if the nodule is 1.5 centimeters or greater and follow-ups if it is 1 centimeter or greater. For TR5 nodules, the guidelines recommend fine-needle aspiration if the nodule is 1 centimeter or greater and follow-ups if it is 0.5 centimeters or greater. The guidelines recommend limiting fine-needle aspiration to two nodules per patient because biopsy of three or more nodules is poorly tolerated by patients, and the third biopsy increases cost with little added benefit and some additional risk. The guidelines also suggest appropriate timing for follow-up sonograms. An interesting information and a post to follow up TI-RAD in detail in scientific journal. Can the source of article or site be shared to continue to read the details.